The article was updated on Oct. 2 with additional graphics. Scores on the state’s standardized tests rose slightly overall in 2018, increasing in all grades but 11th, the only high school grade to take the test, where a big drop countered the big growth in early elementary grades. In English language arts, about half of students overall met or exceeded the standards — the equivalent of proficiency — while 39 percent met or exceeded standards in math. EdSource has made it quick and easy to search for a school’s or a district’s 2018 Smarter Balanced scores — and how much they rose or fell from last year. Go here for the database and here for statewide results. The state released the results of the fourth year of tests on Tuesday. Students took the tests last spring. Test scores are among the indicators of school and district performance on the California School Dashboard, which will be updated with the 2018 Smarter Balanced results later this year. The statewide increase of 1.3 percentage points in English language arts and 1.1 percentage points in math followed a year of flat scores in 2017. 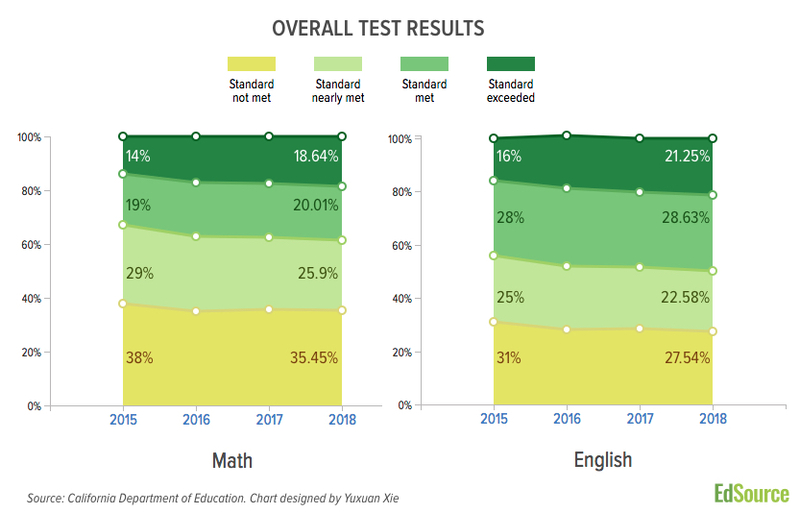 Over four years, the scores have risen nearly 6 percentage points in both English language arts and math, but the biggest bump was in the second year — a common occurrence with standardized testing. If the disappointing 11th grade results were excluded from the statewide average, the statewide increase for English language arts scores in 2018 would be 2.2 percentage points and 1.4 percentage points for math. Gaps among ethnic, racial and income groups remain wide and, in some instances, have grown wider. Only 19.7 percent of African-American students are at or above standards in math, compared with 53.6 percent of whites and 74.6 percent of Asians. And their growth over four years, 3.7 percentage points, is about 1 percentage point less than whites and Asians. However, the increase in Hispanic students’ scores — 5.7 percentage points over 4 years in math and 7.2 percentage points in English language arts — exceeded that of white and Asian students in both subjects. 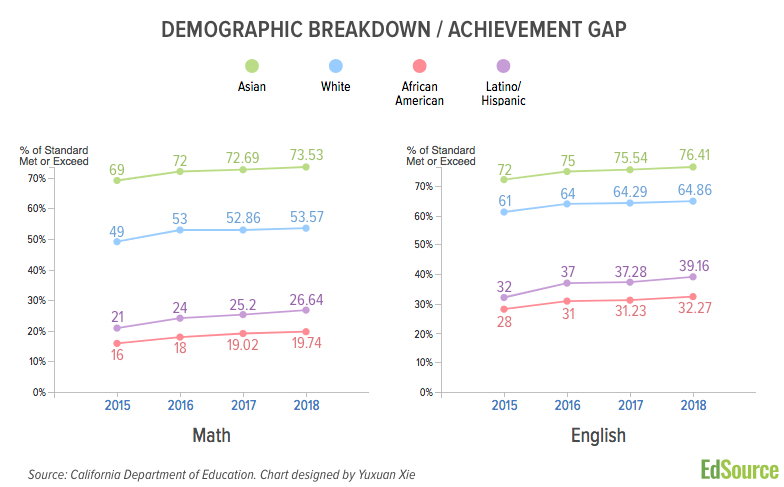 But the difference in scores — about 25 percentage points below whites and 37 points below Asians in English language arts and nearly the same difference in math — remains large. This year’s results drew differing interpretations. Michael Kirst, president of the State Board of Education, and Edward Haertel, professor emeritus at the Stanford Graduate School of Education and a specialist in assessment, found nearly double-digit four-year gains in 3rd and 4th grades particularly encouraging (see graphic). These students were instructed in the Common Core standards in math and reading since they started school, Haertel wrote in an email, and benefited from the training their teachers received. The switch to Common Core happened after many middle and high school students were past the early grades. “That our younger learners who have experienced standard-aligned instruction since kindergarten are improving faster is encouraging,” Kirst said in a statement. But Arun Ramanathan, executive director of Pivot Learning Partners, a nonprofit organization that works with schools on improvement strategies, said it was “distressing” that students’ scores in general have flattened since the second-year bump in upper elementary and middle school. He attributed this to poor implementation of Common Core standards and the selection of low-quality materials. Eleventh grade is the only grade where scores declined this year: 3.8 percentage points in English language arts and 0.8 percentage points in math. Over four years, scores have been flat in English language arts and increased an average of 0.6 percentage points annually in math. No one knows precisely why, but both Ramanathan and Haertel acknowledge a lack of motivation could be a factor. High school juniors are focused on tests that matter to them for getting into college: Advanced Placement, SAT and ACT. Results on Smarter Balanced count only as school and district accountability measures. Dozens of districts now offer SAT or ACT for free during the school day and they support replacing Smarter Balanced with those tests in 11th grade, though Gov. Jerry Brown last week vetoed a bill that would to let them do that. “We made sure they all finish the test,” she said, but some students finish a four-plus hour test in an hour. The state said that for the fourth straight year, fewer than 1 percent of students in all grades did not take the Smarter Balanced tests due to a parental exemption — a figure that is lower than in other states. But there were a few notable exceptions, particularly in 11th grade. 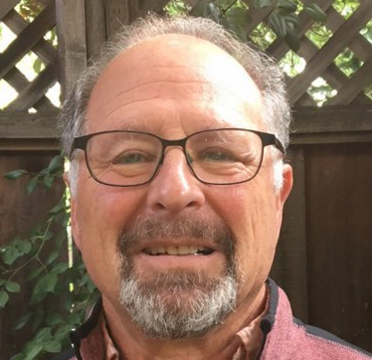 In Palo Alto Unified, only 39 percent of students took the English language arts test and 34 percent took the math test. A quick survey of Sacramento County districts indicated small upticks in scores in some of the larger districts. One that did better than average is 32,000-student Twin Rivers Unified, where 85 percent of students are from low-income families. 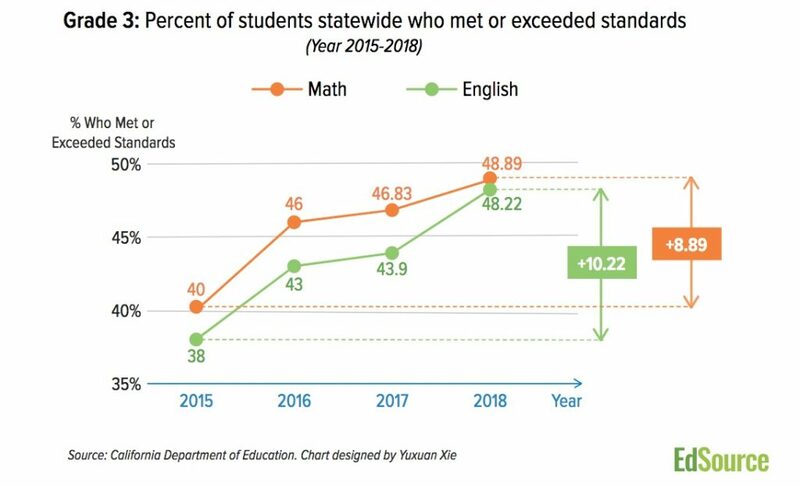 While still below the state average in achievement, the number of students at or above standards rose 4.1 percentage points in English language arts and 2.7 percentage points in math this year. 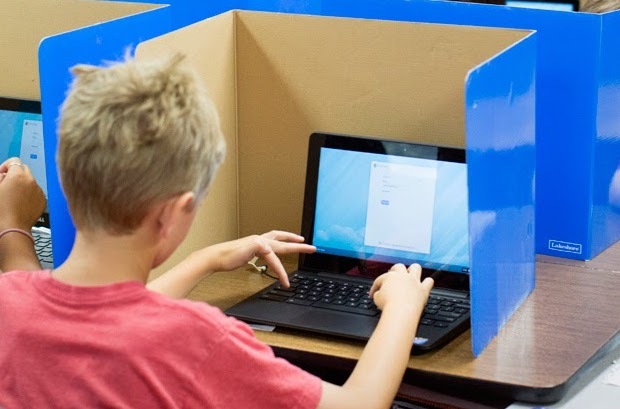 “Last year we were able to provide some really targeted support to our schools in math,” said Lori Grace, Twin Rivers associate superintendent of educational services. The school district hired a Southern California company in May 2017 to supply supplemental materials, coaching and professional development for kindergarten through 8th-grade math teachers at 34 schools. The coaches worked with teachers every six weeks, trained administrators and held parent information nights, she said. “It’s an all-out effort to improve our math scores,” Superintendent Steve Martinez said. In its press release on the Smarter Balanced scores, the California Department of Education cited several districts with success stories, including Brawley Union High School District in Imperial County, which requires writing every day in every class. 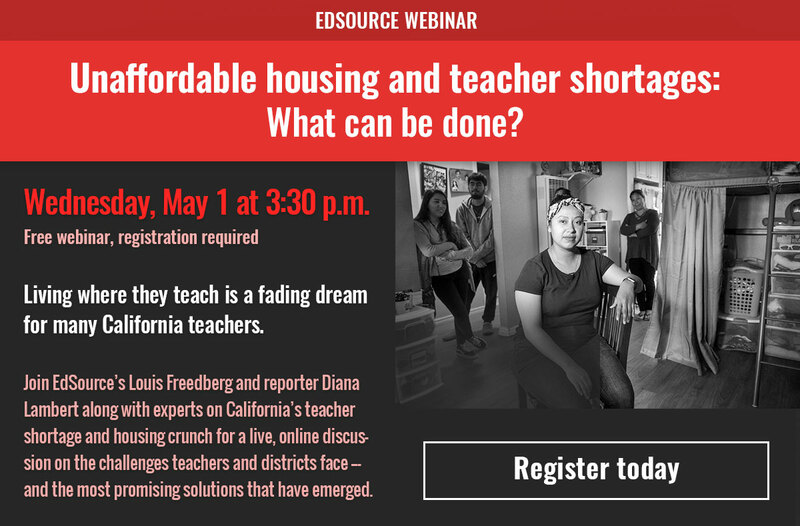 Earlier this year, EdSource reporter Theresa Harrington explained the program. Since its adoption five years ago, the Local Control Funding Formula has targeted low-income and English learners with extra funding: 20 percent additional per student and more to districts with high concentrations of those students. The funding formula also shifted responsibilities for decision-making to local districts, including implementation of new academic standards. One of the studies to examine the rollout of the standards in the recently released Getting Down to Facts project found encouraging signs from teachers and principals whom researchers interviewed. “There were strong signals from teachers in high poverty schools that they were seeing improvement” in teaching and in training in the standards, said Susan Moffitt, a political science professor at Brown University, the lead researcher. Considering the “sea change” that California has simultaneously undertaken with the Common Core and the funding formula, big improvement could take a decade, she said. “We see a little improvement as remarkable,” she said. Bill Lucia, president and CEO of the advocacy nonprofit EdVoice, drew the opposite conclusion. “The Local Control Funding Formula has brought our schools over $200 billion since it was passed four years ago, and all we have to show for it is a one-point increase in student achievement. There is no excuse for such abysmal outcomes,” he said in a statement. In 2018, 37.7 percent of low-income students met or exceeded standards in English language arts, compared with 69.3 percent of their wealthier peers. Only 26.2 percent met or exceeded standards in math compared with 58.4 percent of their wealthier peers. Low-income students increased scores in math by 2.2 percentage points in English language arts this year and 1.7 percentage points in math — slightly above the statewide average for 2018. Most states have switched from the way California measures yearly progress in testing, which compares the percentage of students in a school or district who scored proficient with the percentage of proficient students in the same grade the year before. That method doesn’t take into account students who have made considerable improvement but didn’t reach proficiency nor does it credit students who continued to progress beyond the point of proficiency. A better way is to track the annual growth in scores by all students as they proceed through years of school. The State Board of Education plans to switch once it agrees on one of several methods of measuring student growth. EdSource reporter Diana Lambert contributed to this story. Extra tutoring to meet the standards is not the answer. All schools need to prioritize and invest resources in these three areas. All three are equally important if we are ever going to see a change. * Building the knowledge base for principals and teachers in both reading and math – what is required to go from novice to expert; how to teach so the brain remembers, and makes sense of the learning. Some parts of the learning should not rely on the teacher’s preference/style. There is so much brain research available about how to teach students to read, but most principals and teachers don’t know about it. * Getting the right tools (evidence-based materials) into every classroom K-12 so teachers have the best tools to use everyday. If teachers rely on Teacher-Pay-Teacher because they need stuff, the district is being irresponsible to the students. From this information, it seems that teachers who are the underpaid and struggling professionals of the education industrial complex get no accolades at Twin Rivers School District. In fact, the district repeatedly denies any pay increase to their teachers, not even 1% while dramatically increasing all administrators all the way up to the overpaid superintendent upwards of 7% ! They even handed out certificates to the principals but didnt acknowledge the teachers in the praise. The district repeatedly treats our teachers union TRUSD with disdain and contempt the past several years to the point we certificated teachers are now without any contract. Stealing decreasing income from teachers’ pocketbooks will cause this increase in test scores to be a short windfall. Teachers need to be treated as professionals who deserve a personal quality of life for the educational system to have more deeply felt and lasting gains. I teach high school math and report after report never brings up that every junior tests in math through Algebra 2/Integrated Math 3. Many students haven’t gotten through that curriculum as a junior, but they are still tested on it. How many of you could pass a test on material you have never seen? Why are we wondering so much why scores aren’t improving? When students took the STAR test, they actually tested on the course in which they were enrolled. Maybe getting this fun fact right will see an increase in the scores in the future. Or we could keep ignoring this piece of information and continue to throw money at think tanks and remediation ploys and wonder why those aren’t working too. Let’s also like to highlight the comparison above of low-income kids to their “wealthier” peers. This verbiage perpetuates the idea of a barbell, crying out for redistribution, when in fact most “wealthy” California kids are in private schools. The only data set is low-income vs. everyone else, the vast majority of whom aren’t wealthy but simply living above the poverty line. Why do kids with a little bit more do so much better? Because small financial differences do matter, especially cumulatively. One wonders whether the state hasn’t become addicted to mechanisms that squeeze school funding in tough times — like diverting $4B of school property taxes in 2004 to pay its bills to cities and counties (grown to $8.5B this year). Squeezing schools creates poster children in every downturn whose suffering justifies the next tax bill … but it hurts the kids. We just shouldn’t be surprised when we see that their cumulative learning — and our common society — suffers. The canary in the mine is so so dead! Let’s not rage against the thermometers! The K-12 education is in chaos. It is a suffocating fog as educators pursue every fad and idea that comes down the pike. Results are not improving significantly for students because the system is not focused on the right stuff: quality curricula aligned with the standards; relentless focus on system-wide improvement of professional practices; and a great deal of attention paid to both formative and summative assessments. Most district leaders can only spout educational platitudes and then broker PD improvement to vendors who visit schools infrequently. “Colleges of Education” are really the root cause of our problems as they recruit the least qualified and then fail to prepare them adequately. This leaves school districts in a perpetual state of PD triage to shore up the professional practices deficiencies while fighting Unions whose contracts protect teachers from too much supervision. Of course teachers need to protect themselves against ineffective district leaders who could not teach their way out of a paper bag let alone authentically lead true reform within the K-12 system. The K-12 educations system is totally broken and requires a major transformation if we are going to see improvement in student outcomes. Hopefully, the next generation of leaders will have more luck than the current crop of schmoozer leaders. Learn more at my blog at http://sipbigpicture.com/blog. I am so sick of hearing how much funding and attention is for low-income (some of those low income are very wealthy families that show low taxable incomes but are able to hire outside tutors for help with Math) – what about middle income students? Also, I’m tired of Math departments and teachers telling students to get after-school help. What if the student plays sports or interns? Why can’t they figure out how to actually teach better in smaller class sizes? Why can’t they offer “different math” like Calculus for Business or Arts instead also? For a comparison of California’s 2018 Smarter Balanced results to results from all other states using consortium tests (PARCC as well as Smarter Balanced), go here. The bottom line is that the 2018 consortium-wide Smarter Balanced gain scores were a partial recovery from the consortium-wide declines documented last year for 2017 Smarter Balanced results. Concerns re the comparability of Smarter Balanced tests from year-to-year (required for legitimate calculation of gain scores from year-to-year) remain. These concerns affect the credibility of California’s status-and-change multiple measures LCAP Dashboard system, not due to the Dashboard design by itself but rather due to the credibility of the underlying academic indicator change data.